I was fresh out of surgery, for a pretty serious injury, in which I was heavily self medicating on cheap beer and bad behavior. Coasting half way across America in a car with expired tags, no inspection, and without insurance, I landed in my hometown temporarily disabled, and with no plan for my future. I had moved away 5 years previous, and already it had seemed like a lifetime ago. My family had moved, but i was still connected to Ithaca New York, a town that had and would always be some kind of home for me. This time I was couch surfing, with Mike Tag, Bones and Brad as Hell. A semi rogue party house on Spencer Street. Upon one of my first nights back, an after hours party had the house mixed with subversive types, hell raisers, pretty versions of homely girls I went to high school with and the typical late night drug rug burnouts recovering from adolescent acne trouble and wayward ambition. I sat perched on the inside corner of the kitchen countertop, with a cast dangling from my knee toward the floor. 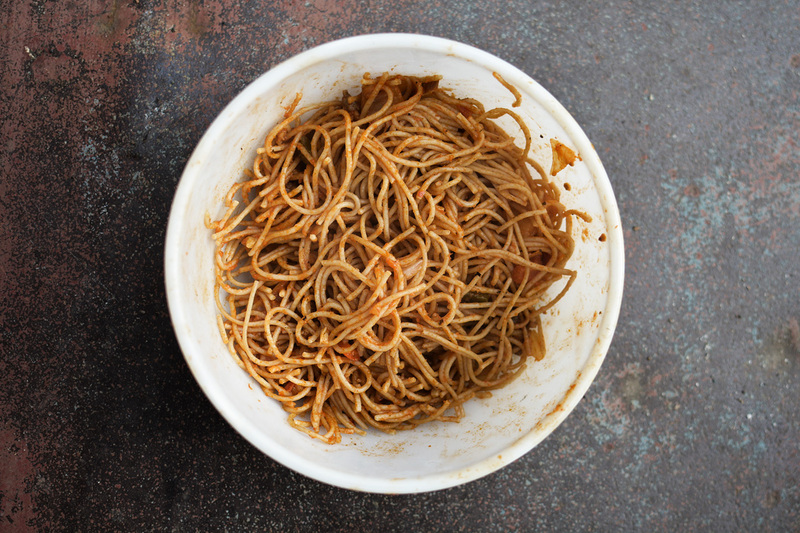 My friends and I recounted misadventures, all the while, a 2 gallon cauldron of overcooked spaghetti in runny bargain flavored tomato sauce, sat half congealed, and half soaking in a puddle of an unfinished meal, just two feet away. As the stash of last call reserves dwindle, and the laughs and stories eventually spread to curious half strangers, soon the antagonism and late night bravado rears its head. At some point the tales shift to exchanges and one guy ends up insulting me in typical “who is this dude” fashion when a new face in the crowd garners attention. I wasn’t new in town, but to these guys I was a stranger. To me it was strange for someone to challenge me in my best friends house. One of my friends, known simply as Blackneck, assured the fellas, I was just a big teddy bear when I retorted with less playful words and more insults came my way. With his ego assured I was a benign threat, I caught a few more offenses before sliding off the counter top, onto one leg, and sent a right hand to another man’s snot locker. The floor was instantly puddled in blood, spilled beer and covered muddy/bloody foot prints in another one of my record scratch moments as Mike and Ham Bone charge into the kitchen scolding me. I hadn’t been in town but a day and I had already managed to piss off my friends, in their own home, Great. Looking at the floor which strangely resembled the pot of un-eaten spaghetti on the stove top, Mike in a stern tone, reprimands me for making a mess in the kitchen. I exhaled, I thought I had crossed a line by breaking one his friends nose, but in reality it was the mess on the floor that had me in hot water… he did’t know the guy. The next day in a lazy warm hungover afternoon haze, Leg propped on the coffee table, Ham Bone caught somewhere between a water pipe, and video games, Tag somewhere in the peripheral, the previous evening was recounted through laughs as the sound of an ice cream truck’s jingle creeps closer. Mike and I had developed some kind of contempt for these guys, disguising their invasive, borderline seedy trolling of the neighborhoods we lived in, with summertime treat offerings. We were pranksters and we hated when that song jingled unsolicited into our airwaves. Ham Bone was totally unaware. I stepped out side and motioned for the Ice Cream man to stop, using my body language to indicate I was going to get some money, by holding my index finger in the air signaling to hold on for a moment. I muttered something to the effect go “watch this…” and went to the kitchen and grabbed the pot of Spaghetti that had been festering for the past day and half. I hobbled out the door, awkwardly handling a a giant pot of over cooked pasta and hurled it into the cab of the ice cream truck, and all over the unsuspected vendor of bomb pops and fudgesicles.